Front-row starters and teammates Rob Huff and Mehdi Bennani were battling for the lead at the start of the race when they banged wheels going through one of the many fast sweeps that make up the Vila Real street circuit. Normally banging wheels in touring cars is pretty standard racing procedure, but in this instance Bennani’s car was launched into the air and the two span sideways across the track. 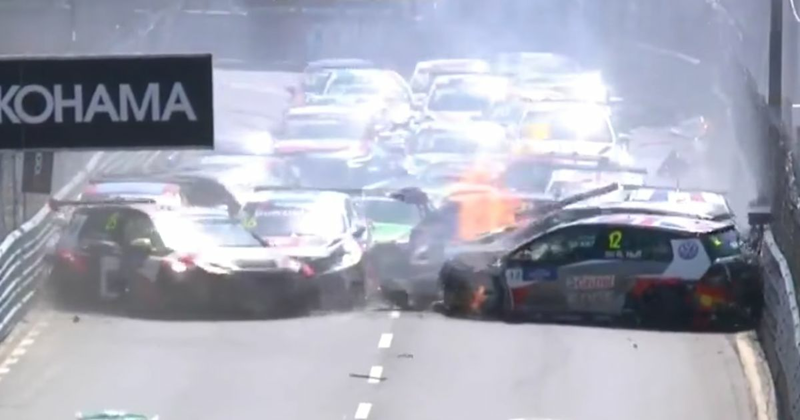 Pretty much the rest of the entire field became involved an enormous pile-up that’s not dissimilar from the one that happened at Macau last year. As you can imagine, the race was red-flagged and took over two hours to restart as repairs had to be made to the barriers.